…librarians and other local cultural educators will receive the package of various learning opportunities, giving them a stimulus to raise their qualifications and conduct new activities for adults. 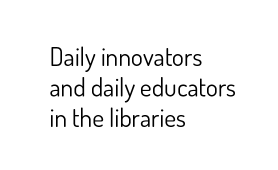 The adult users of libraries and local cultural institutions will benefit from the innovative educational offer, developing the new, creative & entrepreneurial skills and multicultural & social competences. It will also contribute to the civic engagement in their local communities.